Ketchikan, Alaska - It was well after midnight on a black and rainy Ketchikan, Alaska, night in late August 1964 when Stedman Hotel owner/manager, Gordon Zerbetz himself, welcomed my family and me to his hotel. We Allens, seven of us, were clutching luggage, paper bags and candy wrappers or comic books, and still lurching a little on unaccustomed sea-legs after the long State Ferry journey south from Haines. We had begun our long and tiring adventure in far-to-the-north Fairbanks en route to Ketchikan, our destination.. Our five tired and cranky children were whining and complaining. 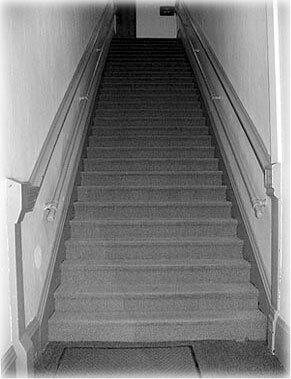 Gordon Zerbetz (I didn't call him by his first name until much later) ushered us all up the Stedman Hotel's stairs. As tired as I was, I noticed what an interesting old building it was, still very much as it probably had been back at the turn of the century. It so happened that on the weekend we arrived, Ketchikan was also hosting a statewide PTA convention. Hotel rooms were scarce by the time we got there! But Gordon managed to find us suitable accommodations. He took our eldest, a boy, to a small room by himself. The four girls moved into a room with us, the two older girls sharing the single bed across from ours and the two little girls sharing a rollaway wedged between the two twins. It was pouring down rain outside. We were exhausted. Gordon had a natural talent for accommodating people without fuss. He was soft-spoken, courteous and kind. I never ever heard complaints about him from any of his employees, and he owned or managed quite a few, varied businesses. He had been born in Ketchikan, in the old hospital on Bawden Street, back in the 1920s. He was a comparatively quiet and smiling man, one of those silent types that surprise you later by their various interests and talents! I didn't really notice Gordon Zerbetz the night of our arrival in 1964, however, and didn't know he had stayed up so very late just to welcome us and get us settled for the night. I probably didn't even thank him for the courtesy and the accommodations he somehow had pulled out of a hat for us that night. But after I'd had a little rest overnight, I was quite curious about his old hotel. How old was it? It looked to me like very little had changed since it was built, which I later learned was in 1905. I was delighted to discover that down the wide hallway, the bathroom was called a "Bathroom," and that's just what it was, a room in which to take a bath. The room with the toilet was labeled, too, with a little metal sign that read "Toilet," self explanatory, as it turned out. The following morning I counted the stairs as we clattered down to the Stedman Hotel Café. There were 29 steps. I later counted a number of other stairways in downtown Ketchikan to see how they compared. Most of the old buildings there have 25 stairs from first floor to second - I know, I've counted them every time I've climbed them. It's a compulsion. Gordon had left as much of the old Stedman hotel as original as he possibly could during its renovations. That saving of history was not necessarily as popular a practice back then as it is today. There were wonderful swinging doors between the lobby and the adjacent cocktail bar and another set farther back in the lobby that opened to the banquet room. I was delighted by the ancient telephone switchboard in the lobby, that row of cords to plug in above a matching row of toggle switches. It still worked and was used! On the cafe wall was a huge oil painting of a lake and forest that also boasted a couple of totem poles ­ among the most popular of Ketchikan's Alaska Indian art icons. Some years later when I was doing a story about the old hotel, it was pointed out to me that the 2x4s used in the hotel's construction were not the size of today's two-by-fours. They are larger. I don't know why, but I do know that the hotel was built with lumber from the turn-of-the-century and long-since vanished Tsimshian Indian sawmill on Gravina Island, which was about where today's Ketchikan International Airport is located. Cut lumber sizes may not have been standardized that far back? From the beginning, the elegant Stedman Hotel boasted its graceful landmark cupola, visible from the harbor as a beacon for arriving ships and even appreciative little skiffs from Pennock Island. 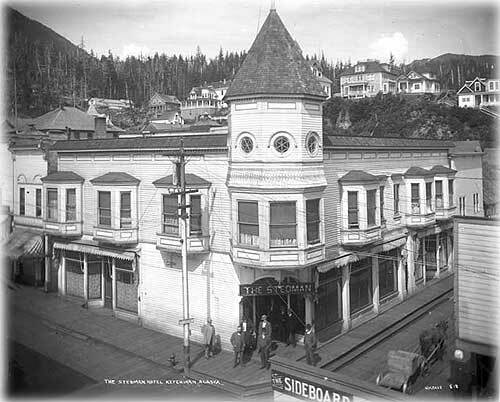 A lot of hometown folks blamed the new (in the 1960s) owner of the old hotel, Gordon Zerbetz, for the loss of that cupola, but it actually it was a department of the overzealous City of Ketchikan that said it the cupola had to come down a fire hazard or something. And so it goes and so it went. The cupola, however, is visible in the many, many photos of the town's queen of hotels, so it is still with us. Times have pretty much changed, not always for the better, from years earlier when the classy Stedman Hotel personnel stealthily tugged open the "storage door" on the walkway off the hotel's first floor hallway and offloaded bootleg booze! Skiffs slipped silently under the building in those days to hand up their illegal cargoes. Of course that was during the "moral engineering" of Prohibition. And the trap door is still there, as are the piling that support the hotel's foundation over the salt water tides that ebb and flow under it. The largely unseen world of ebbing and flowing under the rough plank docks is home to pigeons raising their young, seaweed, the occasional empty whiskey bottle, sometimes an adventurous or maybe a drunk derelict. It smells down there at low tide like well, like Ketchikan. But back to Gordon. He would do almost anything for the community! When the First City Players had no place to rehearse or even to present their earliest productions, he had a small stage built for them at the back of his banquet room. He was willing to tack up big homemade posters all over his businesses, announcing the plays to be presented. There were those who said he did those generous things to make money for himself during the productions. Not so! The truth of the matter was that Gordon Zerbetz was a "closet" actor!! When the First City Players' director, the late Chuck Maniscalco, realized that fact and cast Gordon in the role of the hero Sweet William in one of the productions of the long-running melodrama "The Fish Pirate's Daughter," quiet and soft-spoken Gordon Zerbetz walked in for dress rehearsal dressed in the short pants of a boy scout with a pink-rouged knee with a band-aid stuck to it. It was delightful! He had to work on making his voice loud enough for the whole audience to hear ­ and he did just that. He played that role with a sweet smile and the cachet of Sweet William himself. These are my own memories. I know there must be many more of others' in the community. And it's hard to think of Gordon now as "gone." He's always just "been there." He was born in the old hospital on Bawden Street, I believe, and while he went away for his education at both Southern Methodist University and Whitman College, majoring in economics and business administration, his heart was always in Ketchikan. Gordon Zerbetz, you will be missed. But you'll never be forgotten.